As busy wedding photographers our weekends are full and week days are spent editing images and meeting with couples. 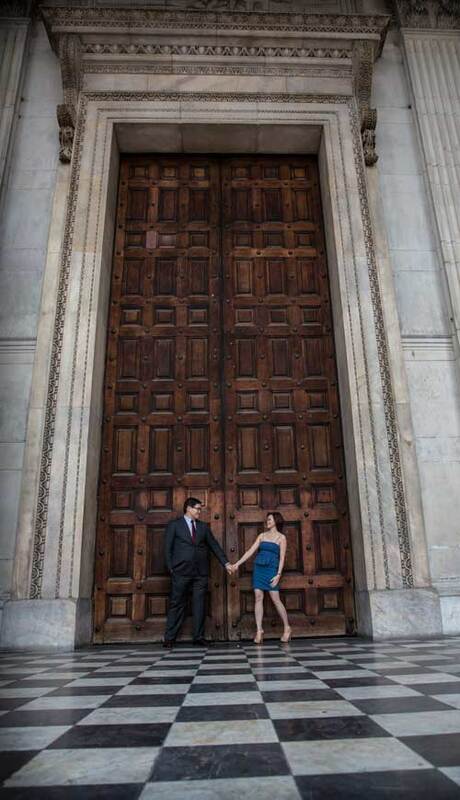 Our week also usually has at least one London engagement shoot. Many of our wedding collections: Pricing contain a complimentary studio or location engagement shoot, which is great for getting to know a couple and relaxing them in front of the camera. It is also a good chance to collect and create images that may be used on invitiations, signing boards and displays for the actual wedding day itself. 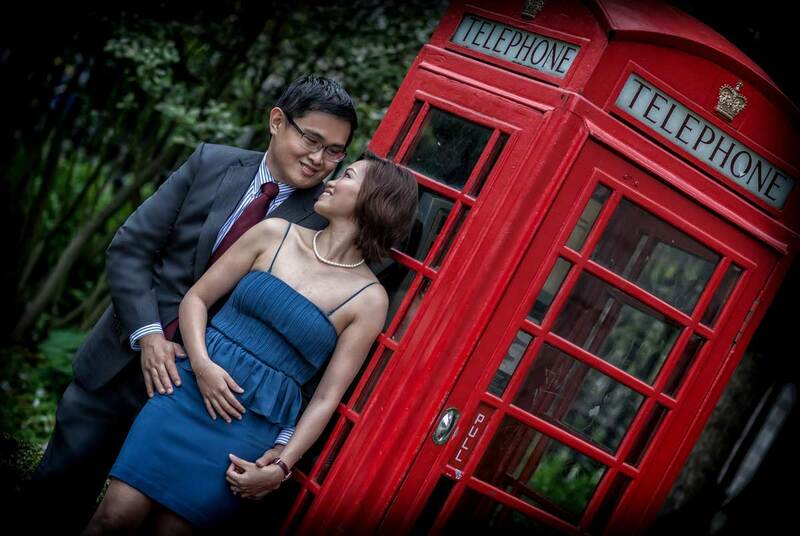 Many couples who are getting married abroad and far away, say for example Singapore, Australia or Japan, choose us as experienced London wedding photographers for a bespoke engagement session in the capital. Very often this is because they have met each other here and want to celebrate and remember that part of their lives.. That was certainly the case for Singaporians Wai-Ling and Justin, who headed over for a few days before returning for work and wedding preparations in their home city of Singapore. Wai-Ling had very specific requirements of where she wanted to go, a kind of trip down memory lane if you like. It was left to myself David to do what I’m hired to do (ha!) and that is pick the spot, mood, angles, composition lighting and camera stuff, then create the moment and magic you would expect! On a typical wedding day Joanna and I are used to having a fairly small amount of time to create the kind of unique shots that are going to be remembered for a lifetime. With an engagement shoot, there is extra time and opportunity for an almost limitless amount of photographic possibilities. As befits a typical English evening it rained, then stopped, then started then…well you get the picture. No problem though, we love umbrellas in shots and it also clears away a great number of the general public off the streets! Starting around the St Pauls area on a Tuesday evening, I noticed an unfeasibly good looking couple posing with a photographer on the steps of the cathedral. A short conversation with the “snapper” revealed the couple were actually models employed to boost his online portfolio. He had initiative that’s for sure but it is something Joanna and I have never done or needed to. We only deal with real couples, their wedding days and engagement sessions! Real people come in all shapes and sizes and it is your job as a photographer to make them look their best in meaningful emotive shots that will stand the test of time. When I worked for glossy magazines doing branded fashion shoots once I had got the lighting and setting right the model could stand on their head, fall over, whatever and they would still look good. They were sculpted and styled to perfection because the army of helpers around us would make sure of that. Your average real world couple has to feel relaxed and comfortable, which is very much down to the personality and people skills of the photographers. They may need to be coaxed a little and certainly gently directed to get the best out of them. The moments and reactions that you see in photographs very rarely happen all by themselves. The photographer also has to take into account that one person may be much taller than another, carry a little more or less weight than another, wear clothes a little more comforatbly than another and so on. An often overlooked but very important point of preparation to bear in mind before your London engagement shoot is what you wear. To help make an akready good photographic image great, and keep the focus on your subject, then plain and simple is best. It is the opposite of the fashion ethos where the garment or accessory is king and the real point of emphasis. So we would always recommend avoiding busy patterns such as spots and stripes, big obvious logos and colour clashes. Nobody wants you to look like The Waltons though! 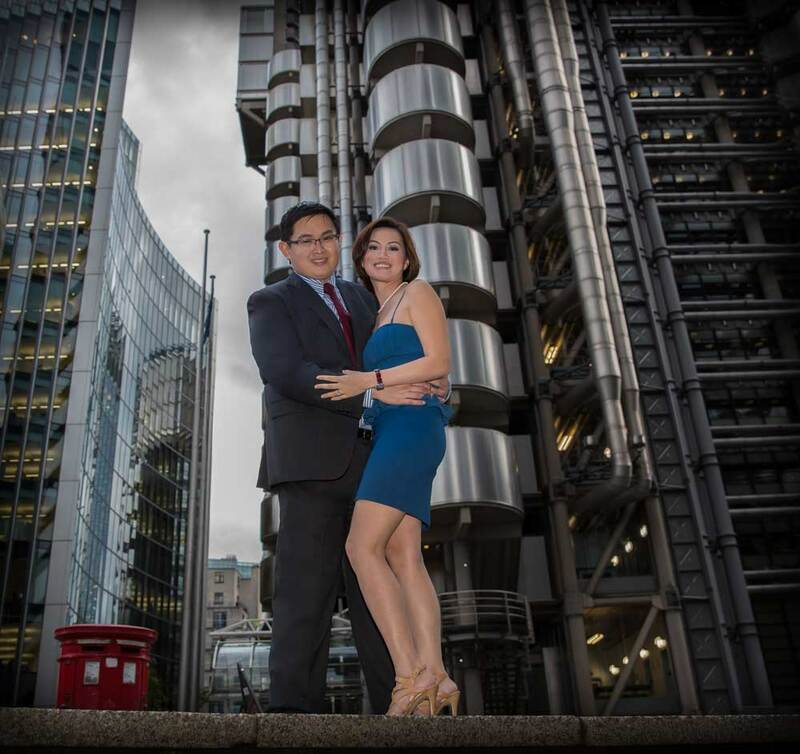 Whether your engagement shoot is part of one of our wedding collections, or a one off bespoke and dedicated photo session, we will design a package and time frame for you to get the best possible experience and results in and around the greatest backdrop we know – London. To set up a relaxed chat, skype or meeting take a look at our contact page here: CONTACT Speak to us about our London engagement shoot prices.